Michele Hill began her quilting journey in 1986 and has been addicted ever since. An award-winning quilter, she started designing her own quilts in 1996 with William Morris and architecture being her greatest inspirations. 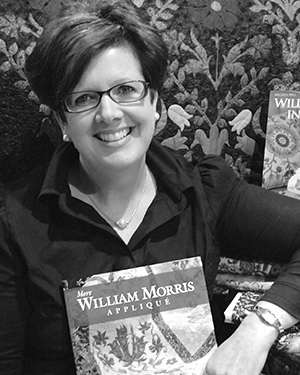 Michele teaches throughout Australia and is the author of four books – William Morris in Appliqué, More William Morris in Appliqué, Afternoon Tea with May Morris and Stitching with Beatrix Potter. In 2014 Michele received the Rajah Award, the nation’s highest quilting accolade, for outstanding contribution to quilting in Australia. Michele has a huge international following, both for her work and for her delightful personality, and has led a series of very popular William Morris tours in Australia and abroad.